So here is the simplest way to overcome this problem. Download the certificate and store it at some place on the server. Click Start –> Run and then type MMC, press Enter. Select Computer account from the popped up dialog box. Specify the file path in the wizard that will pop up and Finish the wizard. You should see the certificate that has the little golden key icon missing. 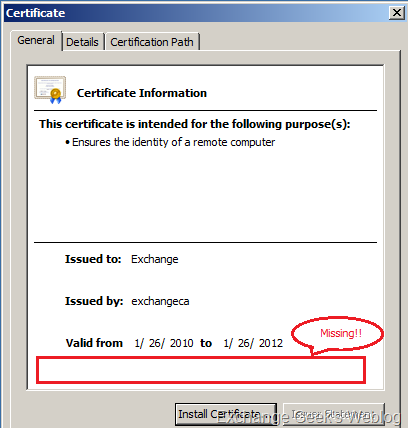 The other certificate you may see is the self-signed certificate generated during exchange installation. Now double click on the newly imported certificate and select the Details tab. Click Serial Number and write down this value or simply copy and paste it into a notepad file. Please note that you will not be allowed to copy using mouse. You can use Ctrl+C instead. 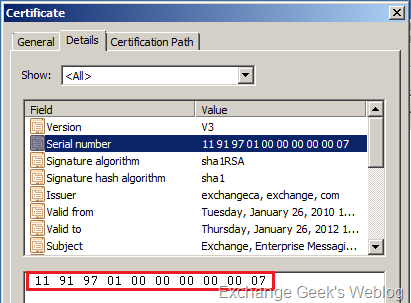 Open command prompt and type certutil –repairstore my “serial number of certificate” and press enter. 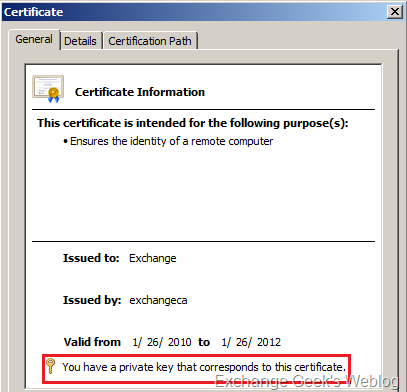 Now, refresh the Certificates MMC and you should see the private key paired with the certificate. Export this certificate into a .pfx file with below options selected during the export wizard. Yes, Export the private key on Export Private Key page. Include all certificates in certification path if possible on Export File Format page. Export all extended properties on Export File Format page. Select the path where the pfx file will be stored and complete the wizard. Now open EMS and and run the following cmdlet. This entry was posted on 27/01/2010 at 1:38 AM	and is filed under Active Directory, Exchange 2010. Tagged: Exchange 2010. You can follow any responses to this entry through the RSS 2.0 feed. Both comments and pings are currently closed. Explained great…was having this annoying problem and after googling enough, found this link and it took care of my issue..
You are amazing!!! That just saved me hours of work and money. I thought I had to start the certificate process over again with the vendor…phew!! Thanks for pointing that out Nathan. I have corrected the spelling mistake now. I am glad that my post could help you.